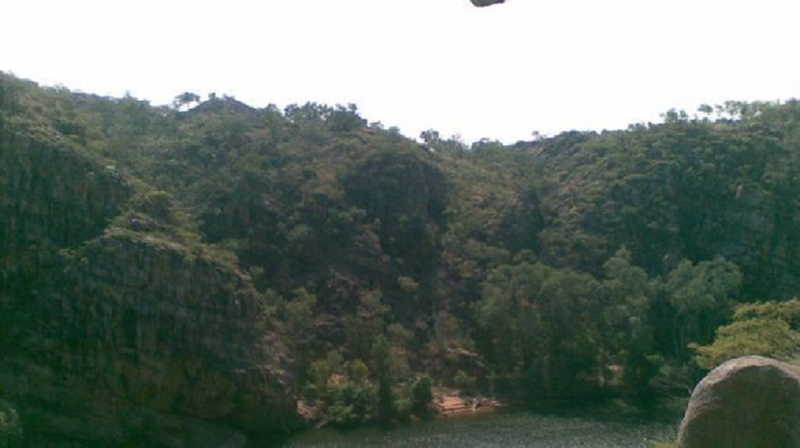 October 4, 2010 – Victorian tourist Adam Rewuk did not realise he captured the image of the flying saucer over Katherine Gorge until he looked back over his photos after the trip. “My Dad used to be a big UFO believer, so when I saw the picture, I thought of him,” he said. Mr Rewuk said the image was definitely not that of a plane or a mark on the lens of the camera. “If I zoom in on the picture, it almost looks like a diamond shape with a bubble on the bottom,” he said. Mr Rewuk said the photo was taken only a few hours before a UFO was spotted at the nearby town show. The NT News reported on July 17 that a bright light had travelled slowly across the sky about 6.20pm. The UFO spooked hundreds of people at the showgrounds as the sun was starting to go down. Mel Auty, from Camira, Queensland, said the UFO looked at first like a plane. “But it was more like a falling star, just not falling. “And it wasn’t dark enough for stars to be out. Vicki Mulholland, of Borroloola, said she was watching the last campdraft events at the show when something caught her eye. The Dropa Stones: Evidence Of Alien Visits To Earth, UFO? a half cropped bird? is that what we&#39;re looking at?<br /><br /> next time maybe you can get TWO birds instead of just one. ummm gidday bro.. yeh… nice pic of kathy gorge.. but where is the UFO?